James Richard "Jimmy" Clausen (born September 21, 1987) is an American football quarterback who is currently a free agent. He was drafted by the Carolina Panthers in the second round of the 2010 NFL Draft. He played college football at Notre Dame. Clausen had an outstanding prep career at Oaks Christian High School in Westlake Village, California. In 2006, he threw 49 touchdown passes for the season to lead the Lions to their first ever Division III state title over Cardinal Newman High School (Santa Rosa, CA). Clausen never lost a football game he started in his prep career (42–0). He threw for 10,677 yards in his career at Oaks Christian. 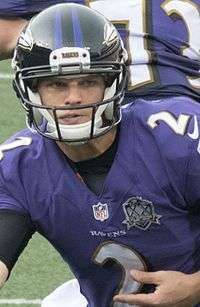 As a senior, Clausen won the 2006 Hall Trophy for the nation's top high school football player and was also named "Offensive Player of the Year" by the USA Today. 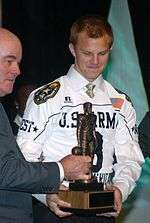 Clausen was also named the Co Player of the Year, along with USC running back Joe McKnight, by Parade Magazine. As the younger brother of two former Division I quarterbacks—Casey and Rick Clausen, who both played at Tennessee—Jimmy Clausen gained media attention very early. Beginning in eighth grade, his parents paid his tutelage under professional quarterbacks coach Steve Clarkson. During his junior season, a Sports Illustrated feature dubbed him "The Kid with The Golden Arm". Recruiting analysts considered him a "once in a decade" quarterback talent and ranked him as the #1 overall prospect of the 2007 high school class. Because of his quick release, some in the media compared him to Joe Namath. Critics have questioned whether Clausen's success in high school was largely a product of his team—containing almost a dozen players that went on to play for NCAA Division I Bowl Subdivision teams, including a highly ranked running back, Marc Tyler—and the inferior talent level of its opponents. Many of these critics pointed to the 2007 U.S. Army All-American Bowl in which Clausen was outplayed by fellow 2007 quarterback recruit, Ryan Mallett. Further, Clausen's age is a subject of criticism: he started kindergarten at six and repeated sixth grade, thus he was 19 years old at the time of his early graduation. On April 22, 2006, Clausen verbally committed to the University of Notre Dame. He was the most highly touted recruit for the Fighting Irish since the arrival of Ron Powlus in 1993. Clausen announced his oral commitment at the College Football Hall of Fame in South Bend, Indiana, after arriving in a stretch Hummer limousine. He also said his goal was to win multiple national titles with the Irish. Clausen takes a snap against Michigan. Clausen, who graduated from high school one semester early, enrolled at Notre Dame on January 16, 2007. In Notre Dame's only preseason practice open to the media, Clausen threw only a number of short passes, casting some doubt on the strength of his arm after off-season elbow surgery. Following Notre Dame's opening loss to Georgia Tech in the 2007 season, Clausen was named the starting quarterback, but would win only one of his first six starts (against UCLA) and was replaced by backup quarterback Evan Sharpley during Notre Dame's loss to Boston College on October 13, 2007. Citing non-specific injuries to Clausen (who had been sacked 23 times), head coach Charlie Weis named Sharpley as the starting quarterback for Notre Dame's game against USC on October 20, 2007. After sitting out Notre Dame's losses to USC and Navy, Clausen was again named the starter for their game against Air Force. Clausen finished his freshman year having completed 56.3% of his passes for 1254 yards, with 7 touchdowns (plus two rushing TDs) and 6 interceptions and a passing efficiency of 103.85, and he was sacked a team-record 34 times. During his sophomore season, he completed 60.9% of his passes for 3172 yards, 25 touchdowns and 17 interceptions and a 132.5 efficiency rating which placed him as the 44th ranked quarterback in NCAA Division I FBS. He led the Fighting Irish to a 7–6 record, culminating in a 49–21 victory against Hawaii in the Hawaii Bowl — which ended Notre Dame's NCAA-record nine-game bowl losing streak. Clausen set Notre Dame bowl records with 406 yards passing and five touchdowns and was named the bowl's co-MVP. In his junior season, Clausen was named midseason All-American by The Sporting News. His finished the season with 3,722 yards passing, a 68.8% completion rate, 161.42 passer rating, 28 touchdowns, and four interceptions. On Monday, December 7, 2009, Clausen declared that he would forgo his senior season at Notre Dame and enter the NFL draft following news of the firing of head coach Charlie Weis. 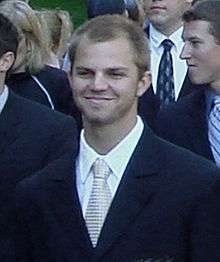 Clausen returned to Notre Dame during the 2011 off-season to finish his degree in sociology. "Clausen is a jerk at times but he's a talented and tough jerk." CBS Sports' columnist Mike Freeman. Clausen announced his intention to enter the 2010 NFL Draft on December 7, 2009. Clausen was expected to be one of the top quarterbacks available in the draft, along with former Heisman Trophy winner Sam Bradford. He was projected by many to be a Top-10 pick. Surprisingly, however, he was not selected in the first round of the draft, with Bradford and Florida's Tim Tebow selected ahead of him. He was selected by the Carolina Panthers with the 16th pick of the 2nd round (48th overall). Analysts attributed his slide to his cocky demeanor and "persnickety smirkness." On July 28, 2010, Clausen signed a four-year, $4.2 million contract with the Panthers, which includes $2.53 million in guarantees. 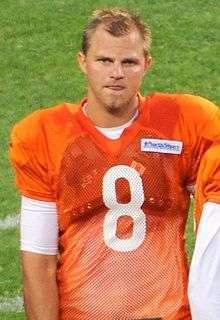 Clausen made his NFL debut in a loss against the New York Giants in the 2010 season opener, after starting quarterback Matt Moore was sidelined with a concussion. After poor play by Matt Moore in a week 2 matchup against the Buccaneers, Clausen took over late in the game. He completed 7 of 13 passes for 59 yards and an interception and one fumbled snap, and led a 17-play drive that was stopped inside the 5-yard line. The following week, Clausen started his first NFL game against the Bengals, completing 16 of 33 passes for 188 yards and an interception and three fumbled snaps, losing two. During the game TV cameras caught wide receiver Steve Smith walking over to Clausen, who was talking with an assistant coach, and screaming at the rookie. Smith walked away, but returned and said something else before being escorted away by tight end Jeff King. At that point, Smith threw down a cup of Gatorade. The incident was later downplayed by Smith. It was the second time there had been communication issues between Smith and Clausen. On May 6, 2010, a report on the website "Pro Football Talk" stated that, "Steve Smith 'basically thinks Jimmy is a punk.'" The website later reported that Smith sent a text message to Clausen that the report was "B.S.". In Clausen's 2nd NFL start (a week 4 match-up against the New Orleans Saints), Clausen went 11 of 21 for 146 yards and completed his 1st NFL touchdown pass to RB Jonathan Stewart. After just three NFL starts and being pulled in week 5, Clausen was benched after completing 47 percent of his passes with one touchdown and three interceptions. Clausen also fumbled seven times, losing two, and had a 52.2 passer rating. Clausen finished the 2010 season with 157 completions out of 299 attempts (52.5%), 1,558 yards with 3 touchdowns and 9 interceptions. He was sacked 33 times and fumbled 9 times, losing two. In 2011 the Panthers used their number one overall draft pick to select Cam Newton of Auburn. After a four-game preseason competition, Panthers coaches decided that Newton would be named the starter for the 2011 NFL Season. Clausen had improved little over his 2010 regular season performance in the 2011 preseason, finishing 24/46 passing (52.2%) and 260 yards and a 5.70 average with 1 touchdown and 2 interceptions and was sacked 7 times in 53 dropbacks and had a quarterback rating of 58.2, similar to his 2010 regular season performance. The Panthers also signed veteran QB Derek Anderson to the team. Clausen was then demoted to third string. In the 2012 pre-season, Clausen was 19 for 37 (51.4%) 252 yards and two touchdowns and like 2011 never took the field in regular season play. On August 31, 2013 the Panthers waived an injured Clausen. He passed through waivers unclaimed, and ended up on the Panthers' injured reserve list. Clausen was signed by the Chicago Bears on June 5, 2014. During the preseason he competed with Jordan Palmer for the second string spot; Clausen eventually won the job. On December 17, Marc Trestman announced that Clausen would take over the starting quarterback position from Jay Cutler. Clausen completed 26 of 48 passes for 181 yards, two touchdowns, one interception and a 77 passer rating in a 20–14 loss to the Detroit Lions. During the game's fourth quarter, Ezekiel Ansah collided with Clausen in a helmet-to-helmet collision. Ansah was penalized and later fined, while Clausen was later diagnosed with a concussion. He relinquished his starting role to Cutler, who played in the Bears' season finale. On March 6, 2015, Clausen re-signed on a one-year deal. On November 23, 2015, he was waived. On November 24, 2015, Clausen was claimed off waivers by the Baltimore Ravens. On December 13, 2015, Clausen started against the Seattle Seahawks, replacing the injured Matt Schaub, who was in turn replacing the injured Joe Flacco. Clausen completed 23 of 40 passes for 274 yards, no touchdowns and one interception in a 35–6 loss. He also started in a December 20 game against the Kansas City Chiefs; he completed 26 of 45 passes for 281 yards, with two touchdowns and two interceptions, in the 34–14 loss. Clausen was then benched for Ryan Mallett, who led the Ravens to a 20–17 upset win over the rival Pittsburgh Steelers the following week. On June 23, 2007, Clausen was cited for illegal transportation of alcohol in South Bend, Indiana. He was driving someone who was of legal drinking age to a liquor store to buy alcohol. According to published reports, Clausen entered a pre-trial diversion program that erased the citation since he stayed out of trouble for the following 12 months. On November 22, 2009, Clausen was involved in an altercation outside of a South Bend pub. Sources indicate that Clausen was there with family and teammates following the team's senior day loss to Connecticut. It was reported that upon his departure, Clausen was punched in the face outside of the pub. A South Bend Police Department spokesperson stated that no police report was filed over that weekend involving Clausen. Reports indicate that Clausen was left with a black eye, which was clearly visible in the broadcast of Notre Dame's next football game. A later report of this incident indicated that the other subject involved in this incident allegedly shoved Clausen's girlfriend. It was reported that Clausen then shoved the subject away prior to Clausen being punched. ↑ DiPrimio, Pete (January 5, 2007). "Notre Dame future starts with new quarterback". Fort Wayne News-Sentinel. ↑ "All-USA players and coach of the year". USA Today. January 12, 2007. ↑ "Clausen Parade Co-Player of the Year, Kamara Parada All American". UHND.com. February 4, 2007. Retrieved 2007-08-01. ↑ "The high price of grooming kids for stardom". USA Today. July 26, 2002. 1 2 3 Anderson, Kelli (November 28, 2005). "The Kid with the Golden Arm". Sports Illustrated. ↑ Evans, Thayer (January 6, 2007). "For Record-Setting Recruit, Full-Throated Praise and Whispered Doubts". New York Times. ↑ Avery, Louie (January 7, 2007). "Mallett Shines Against Nation's Best Players". Texarkana Gazette. ↑ "Clausen just one part of talented Westlake team that seeks another title". USA Today. 2006-08-25. ↑ Friend, Tom (April 21, 2006). "Third in prized Clausen clan to verbally commit to Irish". ESPN. ↑ "Jimmy Clausen Commits to Notre Dame". UHND.com. April 24, 2006. ↑ "Randle among finalists for national award". ↑ "All-USA players and coach of the year". USA Today. January 12, 2007. Retrieved May 6, 2010. ↑ "Clausen enrolls at Notre Dame". Fort Wayne News-Sentinel. January 17, 2007. ↑ McClure, Vaugn (March 20, 2007). "Arm injury clouds Clausen's spring status". Chicago Sun Times. ↑ Rittenberg, Adam (August 6, 2007). "Weis using doubters as motivation for Irish". ESPN.com. ↑ "Clausen gets starting nod at QB against Penn State". ESPN.com. September 4, 2007. ↑ "Notre Dame to start Sharpley at QB vs. USC". Yahoo Sports. October 16, 2007. ↑ Blaudschun, Mark (October 14, 2007). "Eagles Take Fight Out of Irish". Boston Globe. ↑ Coyne, Tom (November 8, 2007). "Weis: Clausen back as Notre Dame QB because of zip, accuracy". AP (Yahoo Sports). ↑ "NCAA Statistics by Category". Yahoo Sports. October 16, 2007. ↑ "Notre Dame Cumulative Season Statistics". und.com. January 12, 2009. ↑ "Irish Dominate All Phases En Route To Hawai'i Bowl Win". und.com. December 24, 2008. ↑ "Jimmy Clausen". sports-reference.com. Sports Reference LLC. Retrieved September 6, 2016. 1 2 Freeman, Mike (April 23, 2010), "Talented Clausen can thank smirk for drastic draft fall", CBS Sports, archived from the original on October 14, 2012 . ↑ "Rams take Bradford with No. 1 pick, hope he's their franchise QB". NFL.com. National Football League. April 22, 2010. Retrieved April 22, 2010. ↑ "Broncos deal three draft picks to move up, take Tebow in first round". NFL.com. National Football League. April 22, 2010. Retrieved April 22, 2010. ↑ "Jimmy Clausen Combine Profile", NFL.com, retrieved February 27, 2010 . ↑ Yasinkas, Pat. (October 18, 2010) "Panthers to start Matt Moore again" ESPN.com Retrieved October 18, 2010. ↑ Sessler, Marc (June 5, 2014). "Bears sign ex-Panthers QB Jimmy Clausen". NFL.com. Retrieved 2014-06-05. ↑ Wright, Michael (December 18, 2014). "Bears giving Jimmy Clausen start". ESPN.com. Retrieved 2014-12-18. ↑ Peters, Micah (2014-12-21). "Bears quarterback Jimmy Clausen was furious after brutal helmet-to-helmet hit". USA Today. Retrieved 2014-12-30. ↑ Mayer, Larry (March 6, 2015). "Bears sign Clausen to one-year deal". Chicago Bears. Retrieved March 7, 2015. ↑ "Bears waive QB Jimmy Clausen, promote David Fales". chicagotribune.com. Retrieved 2016-01-01. ↑ Orr, Conor. "Jimmy Clausen claimed off waivers by Ravens". NFL.com. Retrieved November 25, 2015. ↑ Patra, Kevin. "Jimmy Clausen to start for Ravens; Matt Schaub out". nfl.com. NFL. Retrieved December 13, 2015. ↑ "Jimmy Clausen". pro-football-reference.com. Sports Reference LLC. Retrieved September 6, 2016. Fleming, David (April 19, 2010), "Jimmy Clausen's pursuit of the perfect throw", ESPN The Magazine . Wikimedia Commons has media related to Jimmy Clausen.